Obituary – Miller, John Alan « Perry High School Alumni Association, Inc.
﻿Band 69-72, Stage Band 71-72, Okla. Sen. Page 70-71, Jr. Play Publicity Manager. ﻿John Alan Miller, 26, of 505 Cypress Station, Houston, Texas, formerly of Perry, was fatally injured at approximately 2:45 p.m. Wednesday in a traffic accident at a street intersection on the west side of Houston. Arrangements for services were pending Thursday at the Parker Funeral home in Perry. Miller and his wife, Eva, 21, were on a motorcycle that collided with an automobile at an intersection. Mrs. Miller was listed in critical condition at a Houston hospital. Mrs. Miller was to undergo surgery Thursday. The couple had been on their way to meet with Miller’s brother, James A. Miller Jr.
John Alan Miller was born April 15, 1954, at Enid. 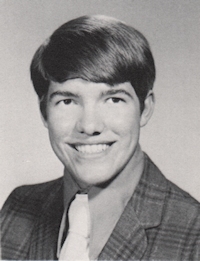 He graduated from Perry high school in 1972 and attended Oklahoma State university. Miller was employed at the Perry Exchange Bank & Trust Co. from 1973-76 and moved in 1976 to Houston. He had been employed in the can division of the Houston Reynolds Aluminum Co. He was married June 8, 1980, at Felt, Okla., to Eva Wills. She is the daughter of John Wills, Houston, formerly of Perry. Miller, was a member of Christ Lutheran church of Perry. Survivors other than his wife of the home at Houston are his mother, Mrs. Mabel Miller, Perry; one sister, Mrs. Bud (Judy) Coffman, Blackwell; one brother, James A. Miller Jr., Houston; and his maternal grandparents, Mr. and Mrs. Phil Plano, St. Petersburg, Fla. He was preceded in death by his father, James A. Miller Sr., Jan. 26, 1979.